A week and a half ago, during a trip to visit Oxford Zooniverse Headquarters, I traveled to Mullard Radio Astronomy Observatory outside of Cambridge to meet with the Sky at Night’s co-presenter Dr. Maggie Aderin-Pocock. We talked about main-belt comets and how the public could get involved in Comet Hunters to search for these elusive breed of comets residing in the Solar System’s asteroid belt. In particular, I discussed the new HSC survey data that recently went live on the project. website. 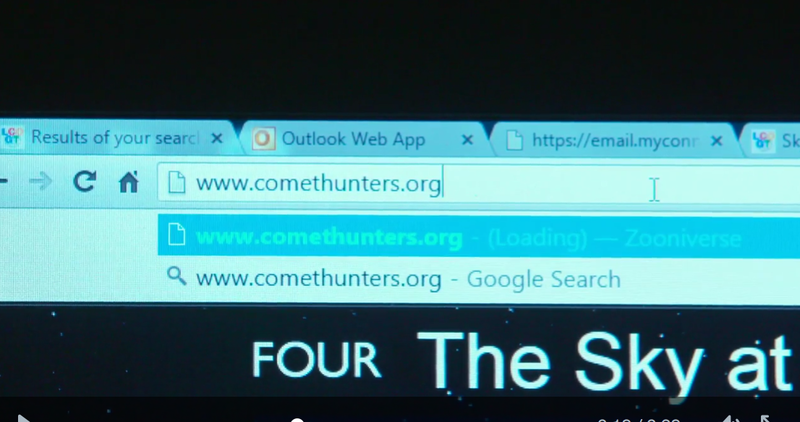 Below is a link to a clip from Maggie encouraging people to join Comet Hunters. This is part of the BBC’s Do Something Great Campaign, which promotes and encourages ways for everyone to get involved in volunteering and doing good. We’re thrilled to be involved in this effort with the Sky at Night. Help astronomers find main-belt comets today at http://www.comethunters.org and if you’re based in the UK check out the Sky at Night’s latest episode on iPlayer. By now, hopefully many of you have had the chance to try out the newest iteration of our Comet Hunters main-belt comet search that features data from the Hyper-SuprimeCam (HSC) Subaru Strategic Program, or the HSC Survey for short. This survey is a ~300-night, 5-year observing program on the 8-meter Subaru telescope (which is the telescope used to obtain all of the data you’ve been previously classifying for the original Comet Hunters archival data search, though using a different camera) that aims to address a wide variety of scientific areas from cosmology to galaxy evolution to searches for distant objects in our own solar system. While HSC survey observations are not specifically optimized for searching for main-belt comets (see below), with a few tweaks to our original classification interface, we still hope to use the data to search for previously unknown comets, with the added advantage of the data being relatively new compared to the data being used in our archival search, and also set the stage for an even bigger future expansion of Comet Hunters. The main difference between HSC survey observations and the archival observations that we have asked you to review until now is that each HSC survey image has an exposure time of several minutes or more. By comparison, for our archival search, we have tried to only use images with exposure times of less than 1 minute each. Exposure time is how long the camera’s shutter remains open collecting light for a particular image. For regular hand-held cameras that you might be used to, longer exposure times can be used to take photos in low-light conditions. For astronomy, longer exposure times are used to study very faint objects. The usual analogy used by astronomers is that of a bucket collecting rain drops. The longer you leave the bucket out, the more rain drops it will collect (or for astronomy, the more photons from an object in the sky it will detect). For a very faint and/or distant object for which only a very small number of photons reach us on Earth, we want to leave the camera shutter/bucket open for a longer time to collect more photons/rain drops. As a side note, the size of a telescope’s primary mirror corresponds to the diameter of our hypothetical bucket, so by using a large telescope like Subaru and using longer exposure times, we can study very faint objects indeed! The issue for us though is that long exposures work great for studying objects that don’t move in the sky (other than the steady, predictable motion caused by the Earth’s rotation), but not so much for nearby things in our solar system, like asteroids, which typically appear to move in the sky relative to background stars. You can think of asteroids as fence posts along a road while you’re driving, while more distant objects like stars and galaxies are mountains far in the distance. From your perspective, the nearby fence posts appear to move (whizzing past you as you drive) while the distant mountains appear to be essentially stationary. Using the short exposure times for our archival search, the total apparent motion of asteroids compared to background stars was relatively minimal. However, with the longer exposure times used by the HSC survey, the motion of the asteroids we are trying to study causes their images to be noticeably elongated (e.g., somewhat sausage-shaped), just as a photo of a fence post (or other nearby objects) might appear smeared out if you tried to take a picture while driving past. What this means for Comet Hunters is that identifying comets just became a bit harder. For the archival search, we asked you to compare the appearance of each asteroid with reference stars chosen from the same image and make a note of any differences you might see. With the HSC survey data, every asteroid image will look different from the background stars because they will be elongated. Furthermore, any cometary activity that might be present will also be “smeared out”, possibly making it harder to see. Nonetheless, given the large size of the Subaru telescope, we expect to find some comets with activity bright enough to detect even when smeared out. Then the trick is just to try to train your eyes to spot what elongated comets might look like, since they will not really look like most people normally think of when they think of what a comet looks like. To help you out, we have generated some images of what elongated comets could look like and included them in the HSC Survey comet search tutorial (if you need a refresher, click on the “Show the project tutorial button” at the bottom of each classification page and go to the third panel). The other major change that experienced Comet Hunters will notice is that instead of asking you to compare the appearance of a single asteroid to two comparison stars, we now ask you to compare the appearances of a single asteroid that has been imaged (at least) twice in the same night. In part, this is due to the fact mentioned above that comparisons to “stationary” background stars are less useful when most of the asteroids we will show you appear elongated. The other big reason we’ve made this change is to see if this helps to distinguish overlaps (or blends) from real comets. This subject has been discussed in previous blog posts here and here, so we will not discuss them much here, except to say that background objects (mostly stars and galaxies) that might mimic cometary activity typically will not appear to move in the same way as our target asteroids. So, by only focusing on asteroids that consistently show activity from one image to the next, we hope that you will be able to immediately identify cases where “activity” is only present in one image of an asteroid, rather than having to do a time-consuming manual check (as described here). While it may initially take some getting used to, we hope that you will get the hang of searching for comets in HSC data before too long. As mentioned in previous blog posts, the exciting thing here is that this data is much more recent than the archival data we have previously been having you review, meaning that if we discover any comet candidates, we may be able to trigger immediate follow-up observations to confirm the activity and study it further. Another exciting aspect of this sub-project is that there is a lot more archival data available than we are currently using for our original SuprimeCam archival search. As mentioned above, for this initial search, we intentionally restricted ourselves to short-exposure images, but if our attempt to use elongated asteroid images to search for comets is successful, we will be able to draw on the even larger pool of long-exposure SuprimeCam data, and then even include long-exposure data from other medium and large telescopes. As I also mentioned above, astronomers like to use long exposures in tandem with large telescopes to allow them to study very faint objects, so being able to take advantage of such archival observations to do comet searches will greatly increase the amount of data available to us. Since we expect that main-belt comets will be relatively rare compared to inactive asteroids, screening a large number of asteroids is key to finding the rare active ones, so the more data we can use, the better! If you have any other questions about our new search, please comment below. Otherwise, we thank you in advance for helping out with the new search, and wish you happy hunting! The Hyper Suprime-Cam (HSC) is the next generation camera on the Subaru Telescope, replacing its’ predecessor Suprime-cam that had been used for 18 years. The field of view (FOV) has been dramatically increased from 0.16 to 1.5 square degree (10 times!!!). The HSC has not only a large FOV but it is also mounted on one of the biggest telescopes in the world. The camera’s ability and efficiency are the mightiest in the current observatories. HSCs physical extent is larger than three meters. Its focal plane (60 cm in diameter) is paved with 116 CCDs (including focus and tracking chips), operating in -100 degrees centigrade. The diameter of the front lens is 82 cm, the length of the lens barrel is 165 cm. The total weight is 890 kg. Every exposure includes 870 million pixels. Before the HSC era, most of the cameras with large sky coverage were installed on medium or small telescopes (48-inch-a few meter telescopes), e.g. GigaPixelCamera on Pan-STARRS 1 (1.8m), MegaCam on the Canada-France-Hawaii Telescope (3.6m) and Magellan(3.6m), Dark Energy Camera on the Blanco Telescope (4m). Although they can cover a few square degrees, the sensitivity is 25% less than what you can achieve on an 8-meter class telescope. In some astrometry topics, like micro-lensing and large structure in the universe, both large aperture and FOV are vital. The enough sample will lead astrometers to a significant and compact conclusion. The HSC Subaru Strategic Program (SSP) is most important and largest programs o the Subaru Telescope in this decade. This survey started in 2014, finishing at 2019. This program will survey 1400 square degrees, using optical to near-infrared filters (g, r, i, z and y), reaching a 26.5 magnitudes in stacked images. The survey regions are fixed on the equator (Dec = 0) and cross with Ecliptic plane where are the locations including a lot of solar system bodies. Hence, beside cosmology science, this survey data is quite valuable for Solar System science. Now with the HSC Survey Search, you can search for cometary activity in asteroids imaged in the HSC survey on Comet Hunters. As of today, Comet Hunters has a new dataset and a new look. You’ll notice there’s now a button called ‘HSC Survey Search’ on the front page of the website. We are thrilled to announce the incorporation of data from the Hyper Suprime-Cam Subaru Strategic Program. Hyper Suprime-Cam (HSC) is the largest field-of-view camera ever stuck on an 8-10-m class telescope. HSC covers nine times the size of the full moon in a single pointing! What makes this so exciting is that the asteroid images you can review now on Comet Hunters from this survey are as from as close to right off the telescope as we can get. This means we can follow-up and try to catch the asteroid still in the act if Comet Hunters spots a tail. No one has ever looked at these images for main-belt comets before. Your eyes will be one of the first to view these images. Who knows what we’ll find! The old Comet Hunters classification interface you know and love is still around. It’s now under the ‘Archival Data Search’ on the Comet Hunters front page. Looking for main-belt comets in the archival Suprime-Cam data is still extremely useful, and we’ll be keeping that classification interface going in parallel to the HSC Survey Search. You’ll notice the HSC images are a bit different than the Archival Data Search. There’s a tutorial and help buttons that will show you how find tails in the HSC images. You can also find more information on the Research and FAQ pages as well. Dive into the HSC Survey data and help search for main-belt comets today!